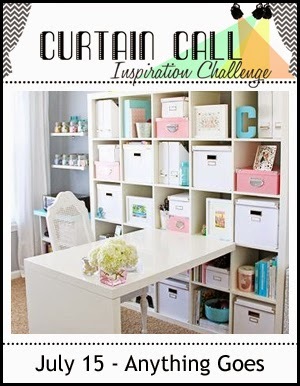 Today we are sharing some more inspiration for the Curtain Call Inspiration Challenge - Anything Goes! On Saturday I had the opportunity to meet up with Ardyth Percy-Robb and a couple of new friends Natasha Kara and Emily Leiphart! Natasha was a most gracious host and although the goal was to get together and craft but I honestly came home with a few die cuts that I managed to crank out! We talked and laughed the day away. Amazing that we all live so close to each other when the city of Toronto is 2.5 million large! I would meet up with these ladies again anytime! Actually I think we are going to Ardyth's in August! Lovely card, Tracey! And how fun that you got together with some online friends! What a sweet card Tracey. Love the fun print on the paper and how you stamped the greeting with different colors. It must have been fun to get together with those crafting ladies! love the papers girl, and such a cute pic of you all! HUGS! i love that adorable tag.. super cute card. I would gladly drive that 6 hours for a day with you fantastic ladies!! Beautiful card, Tracey! Tracey, this is SO CUTE! I love that you stamped the sentiment in the colors from that adorable background paper!! Your get together looks like so much fun! It's really all about the company anyway ;). And I just love the different colors in your sentiment! Lucky girl to meet up with crafty friends. Absolutely awesome. I love your card...the mix of colors on the sentiment is fabulous. Your card is gorgeous. I love the paper you used. And how fun that you could meet up with fellow craft friends. How fun that you all got to meet up! The picture is great and so is your card. I especially love the multicolored sentiment. What a great time you gals must have had! Your card is so lovely, Tracy!!! Great card Tracey. Love the papers and tag design. What an adorable card! Cute papers and I like the multi colored sentiment. Sounds like a wonderful time, what a CUTE photo!! You lucky girl! I bet you had the best day evah!!! 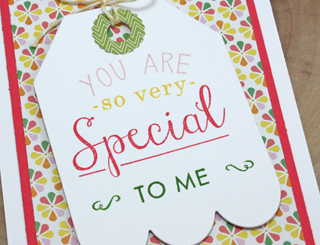 Your card is wonderful too - I love all the different color ink you used on the tag! This is such a pretty card! I really love the colors on the sentiment! Super cute card, Miss Lady!! I love your sweet card...awesome florals! Sweet sweet photo and I love your legs...you are just too darn cute! I am sure you had a blast and agree it would be so hard to get much accomplished while chatting. Your card is equally as sweet and your choice of patterned paper is adorable. You are all definitely welcome at my place any time - I'll figure out some dates! Love your sweet card, Tracey but I love the picture of you with crafty friends even more. So fun! awesome card! so many great prizes! I love this tag! Mine just came yesterday. Beautiful card , Tracey. You all look so beautiful and happy in that picture,how fun! This is such a charming card, Tracey...I love it! 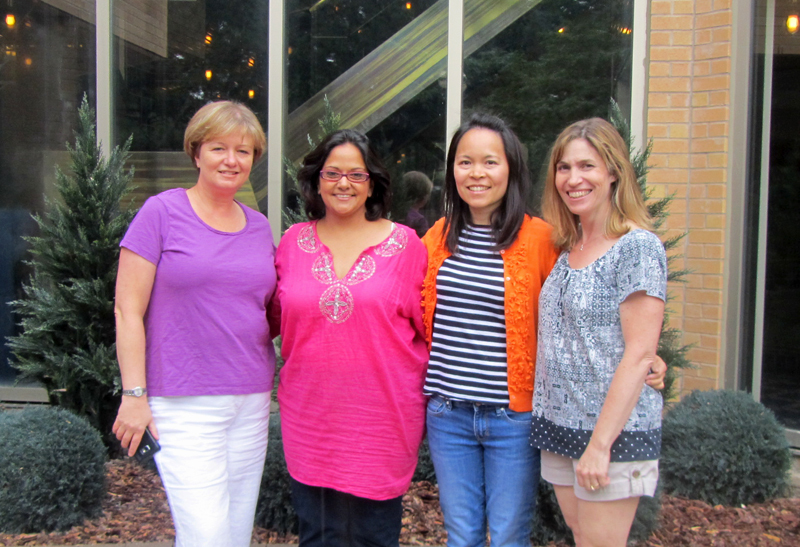 How fun that you got together with some crafty friends! Looks like you all had a great time! Fabulous card--I love that tag and the sweet patterned paper you used. Insanely jealous of you for living so close to your stamping friends. I will have to remember about your snowy winters and then I won't feel so bad. Great photo--so happy to see you were able to visit with some crafty friends! How wonderful to live close. 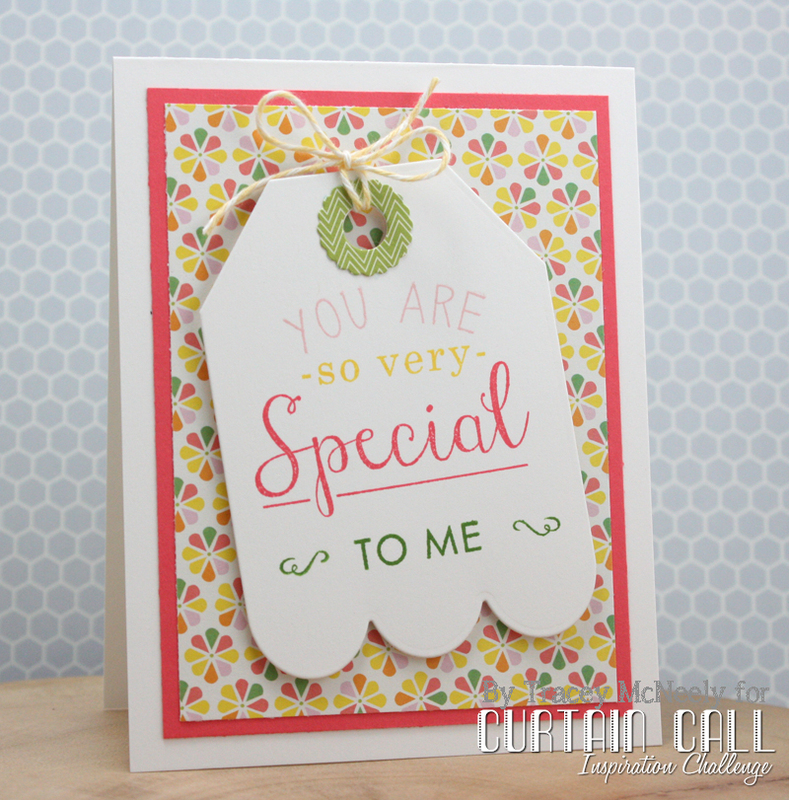 Your card is adorable--love the patterned paper and your sweet tag! Love all the colors in your sentiment! And lucky duck that you got to hang out with Ardyth and Emily! So FUN. Love this tag card! The background paper is so pretty. So fun that you got together with crafty friends!